It’s important to keep in touch with others, and Skype has become a valuable communication tool for both home and business users alike. 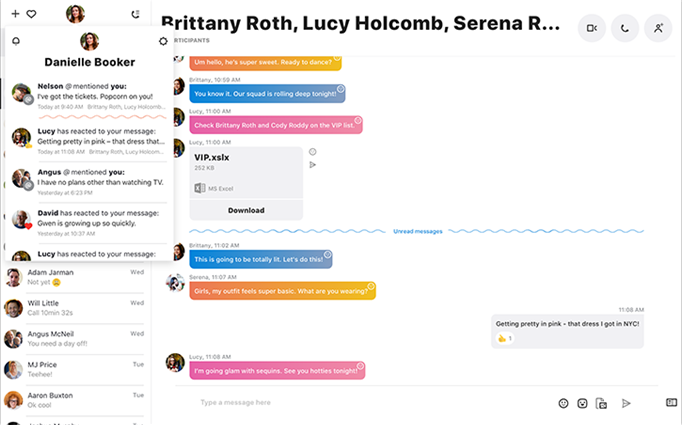 The cross-platform tool can be used to conduct simple text-based chats with your contacts as well as audio and video calls. You can converse with your Skype contacts, but there is also Facebook integration which enables you to make use of your social networking contact list. This new version of Skype is the first big release since the acquisition by Microsoft and it is a radical overhaul for users who have been familiar with on the application. In line with the recent overhaul of the mobile apps, the desktop preview incorporates mentions and notification panels, something many other desktop messaging apps have already done. With the new "@mention" feature you can quickly see a conversation where you've been incorporated into their discussion. The group call feature has had an upgrade. You can drag and drop photos into the call and you can react to anything shared or said in the call with emoji's. There is also a chat gallery to easily be able to find shared content, whether you've shared images and videos with loved ones or you are using Skype at work and have to access important documents as well. The app has had a visual overall so you can pick themes as well to decide what colour suits your mood. For the moment this is a dark or light colour scheme, but with more options to follow. There's a brand new chat gallery, where you can find shared content, files and other information shared within your conversations. This new desktop client is designed for Windows 7 and 8 (the Windows 10 version will be updated automatically as it's built into the OS) or Mac OS X users. Available for Mac and PC – there are also more limited clients available for iOS and Android – Skype has become a serious communication tool. The ability to not only conduct voice and video chats, but also send and receive files, and even make phone calls to landlines and mobile phones, means that Skype is far more versatile than other messaging tools. What's new in 8.43.0.56 (see release notes for more)? - Quickly view a participant's profile while you're in a call: Simply long press or right-click on the participant and select View profile. - Review before you send: Now, when you drop files or media into a chat, you can preview them before sending. - There's more than one way to keep the focus on you: The option to blur your background can now be accessed from the more menu during a video call. - New global hotkeys in Skype for Windows 10 (version 14). - New shortcut to resize camera preview: Ctrl+Shift+J is available in Skype for Windows desktop and Skype for Windows 10 (version 14). Learn more about keyboard shortcuts in Skype. - Updated descriptions for signing out of Skype. For both home and office users, Skype is an incredibly valuable tool and the latest additions are great improvements. HEY SKYPE WHAT HAVE YOU DONE ??? ?